From NASCAR to offroad, and beyond, Fuel Safe has been designing and building custom and standard fuel cells for all forms of racing for over 30 years. Fuel Safe Systems offers a complete line of SFI 28.1 certified drag racing fuel cells are available for all forms of drag racing. Built from our ultra-tough polymer foam-filled Enduro Cell®, these fuel cells deliver unbeatable safety, performance, and durability on and off the race track. To secure 28.1 Certification from the SFI Foundation, Fuel Safe reported test results of its Enduro Fuel Cell, which were authenticated by a licensed professional engineer, SFI Tests included: tensile strength test, impact test, hydrostatic leakage test, fitting pullout test, and flange pull-out strength test. Periodic re-validation test reports are submitted when due to SFI. Thanks to the rigorous testing conducted on our fuel cells, you will have complete confidence on the track and beyond the wheel when using a Fuel Safe Racing Fuel Cell. 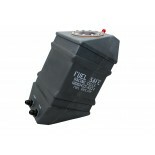 Fuel Safe cells are available in a number of sizes, including 4 gallons, 5 gallons, 8 gallons, 12 gallons, and 15 gallons. All of these size options ensure that no matter what your tank configuration is, you can get the perfect fuel cell for your setup. Enduro racing fuel cell bladder tanks are made of hard rubber which is very durable and cost-effective. These specialized drag racing fuel cells are compatible with a wide variety of fuel types. Fuel Safe's fuel cell bladder tanks are designed specifically to safely deliver fuel quickly and efficiently without the fear of starving your engine. Are you ready for your next race? With Fuel Safe's design, you can be sure your drag racing fuel cell will deliver a winning performance every time!